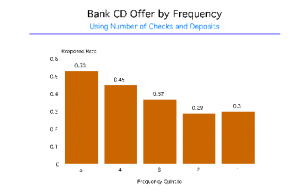 Frequency is defined as the number of times that a customer has made a purchase from you. It is an integral part of the trilogy called Recency, Frequency, Monetary (RFM) analysis that is used to predict customer response in direct marketing promotions. Frequency is often a powerful predictor of response, but it is seldom as powerful as Recency. 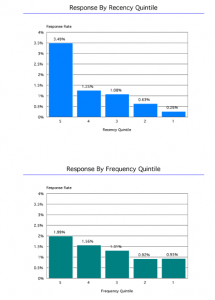 We can easily illustrate the differences by comparing the response rates of the same group of people based on their recency and their frequency. These two charts compare the response rates of 30,000 existing customers to a new promotion for an item that sold for about $100. The overall response rate was 1.34%. To get the first graph, all 30,000 people were sorted by most recent purchase date prior to the promotion, and divided into five exactly equal groups (quintiles). Those in the top group were called 5, the next group were 4, etc. To get data for the second graph, the same 30,000 people were sorted by frequency – how many times they had bought from this company in the past. Again they were divided into five equal groups numbered 5,4,3,2 and 1.Then, to each of these lists, we appended the responses – those people who actually bought the promoted items. What these two graphs show is that Recency and Frequency both predict who is most likely to respond to this offer. The most recent and the most frequent respond better than lower ranking quintiles. The differences in these two charts, however, are striking. Look at the difference between the 5’s on both charts. For Recency, the response rate is 3.49%, whereas the most frequent buyers had a response rate of only 1.99%. This is to be expected. Recency is usually a more powerful a discriminator than frequency. That is why RFM is not FRM or MRF or some other combination. RFM analysis is more than forty years old. Direct marketers knew about these principles back in the Stone Age. They work. Each of these industries has several possible ways of measuring frequency. Which is the best frequency measurement? There is no universal answer, but there is a universal method of finding the answer. The universal method is this: test each of several possible methods and see which of them does the best job of predicting actual response rates. The purpose of RFM analysis is not to find profitable customers. It is to find responsive customers, which is not necessarily the same thing. You want to come up with a method for predicting customer behavior. The best predictor of future behavior is past behavior. Past behavior is better than demographic factors such as age, income, presence of children, SIC code, number of employees, etc. The problem we are wrestling with here is how do you define behavior? We must define frequency of use, and we can do it by testing various methods. The cost of testing is almost zero. You don’t need to hire a statistician. You don’t need to develop a model. You go about it this way. Identify two or more possible measurements of frequency, such as number of purchases or number of items purchased. Sort the database by each measurement from greatest to least, and divide the database into five exactly equal segments (quintiles). The top group are 5’s the next 4’s etc. Carry out any regularly scheduled promotion to your customer base, but keep track of the frequency quintile that each customer is located in. When the responses come in, append them to the database, and draw a graph of the results. The correct measurement is the one that produces the most predictive graph. This chart makes no sense. 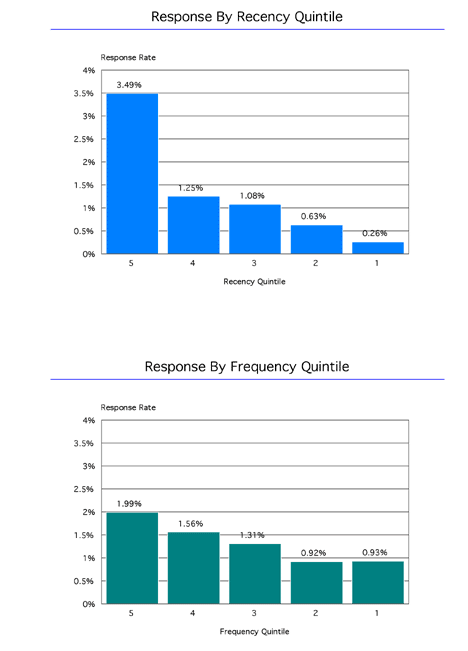 Why would the best responders be those whose frequency is in the third quintile, and the lowest response rate be from those in the top quintile? When I saw this chart, I called the marketing director at the bank right away and asked her what she had done to create this monstrosity. Why is this chart better? Because the measure selected for frequency of use more accurately predicted who actually responded to the offer. These response rates are low: the highest is only one half of one percent. But, for the bank, the rates were high enough to make the overall promotion profitable. Why is it important to have a correct measurement of frequency? Because with a good measurement, it is possible to modify your mailing program to boost your profits by a wide margin. Let’s see what happened in the bank case. 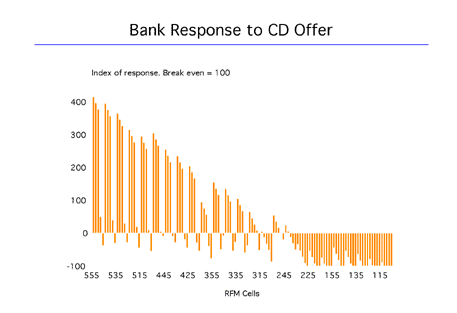 To produce this graph, we had to divide the response rates of each 3 digit RFM Cell by the break-even rate. 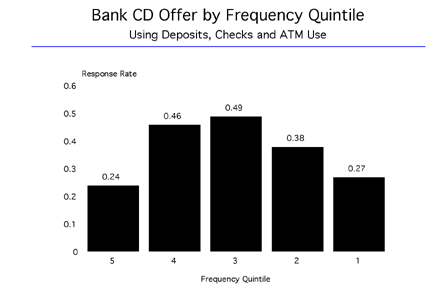 The break-even rate is defined as that response rate at which the profits from mailing to a group of people are exactly offset by the costs of mailing to these people. The formula for the break-even rate is BE = (cost per piece) / (net profit from the average sale). If, for example, a mailing piece including postage costs $0.75 and the profits from a successful sale are $60.00, then the break even response rate is BE = .75/60 = 1.25%. The bank mailed their offer to 250,000 customers. There were 125 RFM cells, so each cell had 2,000 members. To get the index of response, we divided the response rate from each cell by the break-even rate, multiplied by 100 and subtracted 100. For a cell which just broke even (their response rate was 1.25%) the index was: Index = ((1.25/1.25)*100)-100) = 0. 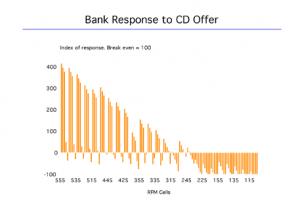 In the case of the bank CD offer, we had to figure what the profits were on a $5,000 CD. Some were purchased for 90 days, some for six months, and some for twelve months. The profit would be the average interest earned by the bank on the $5,000 less the interest paid to the depositor, less the administrative costs. These graphs were created automatically by the software RFM for Windows developed by the Database Marketing Institute. As you can see, the low monetary cells were unresponsive. People with low dollar balances cannot buy $5,000 CDs. Low frequency rates also depressed response. About half of the cells were profitable, and half were unprofitable. Knowing this, it was possible to reduce the mailing in subsequent periods to the unprofitable cells. From the above, it is obvious that the better your measurement of frequency is, the better you can predict behavior and realize the profits that come from basing your direct marketing efforts on RFM analysis. The bank guessed wrong on their frequency measurement at first. By correcting the measurement by looking at the resulting graph, they were able to create a much better measurement of frequency. The result was higher profits for the bank. RFM should not be the chief basis of your customer contact strategy. The reason is that if it were, your less responsive customers would never hear from you, and your more responsive customers might suffer from file fatigue. 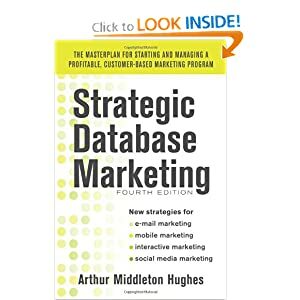 There are times, however, when marketers have to use their customer database to make serious money. Knowing the best way to measure frequency (as well as recency and monetary) is crucial to this effort.